Forghani, A., Dehghanian, F. (2014). An Interdiction Median Model for Hierarchical Capacitated Facilities. International Journal of Research in Industrial Engineering, 3(1), 1-10. A. Forghani; F. Dehghanian. "An Interdiction Median Model for Hierarchical Capacitated Facilities". 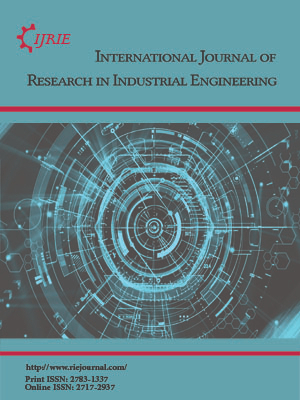 International Journal of Research in Industrial Engineering, 3, 1, 2014, 1-10. Forghani, A., Dehghanian, F. (2014). 'An Interdiction Median Model for Hierarchical Capacitated Facilities', International Journal of Research in Industrial Engineering, 3(1), pp. 1-10. Forghani, A., Dehghanian, F. An Interdiction Median Model for Hierarchical Capacitated Facilities. International Journal of Research in Industrial Engineering, 2014; 3(1): 1-10. In this paper a partial interdiction problem on a capacitated hierarchical system is studied. We consider an attacker who can interdict facilities at different levels and each interdiction level causes a specified reduction in the capacity of a facility depending upon its service level in the hierarchy. First, the interdictor identifies her interdiction strategy whose aim is to cause the most demand satisfaction cost subject to her budgetary limitation. Subsequently, the defender tries to optimize the objective function which is similar to the attacker’s one but in the opposite direction. The defender is responsible for choosing the least cost strategy in order to satisfy all customers’ demand. She can achieve this goal by two ways: (1) allocating their demand to the hierarchical facilities subject to their residual capacity, (2) benefiting from outsourcing option. This problem can be regarded as a static Stackelberg game between a malicious interdictor as the leader and a system defender as the follower. In this paper we propose a bi-level mathematical formulation in order to model the problem. To solve this problem with exhaustive enumeration, CPLEX has been used.